This memorial fresco of Venceslao Lazzari can be seen in the Palazzo dell'Archiginnasio in Bologna (Piazza Galvani 1), at the base of the "Scalone degli artisti" (Artists' staircase). It was painted in 1601 by Lionello Spada. Nowadays part of the memorial is almost unreadable due to the bad preservation along the years. 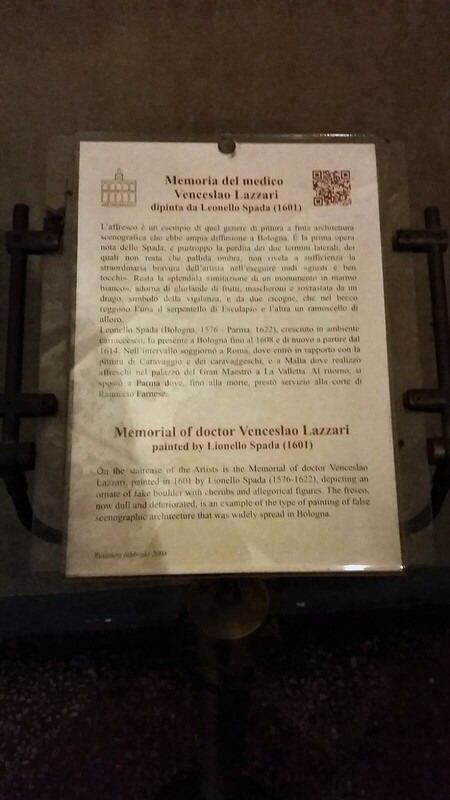 The latin inscription reads as follows: "VINCISLAO LAZARO PHILOS. ET MEDICO NOSTRAE AETATIS CLARISSIMO / IN HAC BON. ACADEMIA TRIGINTA IAM ANOS IPSOS / MEDICINAM ORDIN. ET EXTRAORDINARIAM PRACTICAM / ET THEORICAM GLORIOSISSIME PROFITENTI / SENATUS BONON.QUINQ. AB HINC ANNIS EMINENTEM / SUPRAORD. INTERPRETIS PERSONAM DECREVIT / UTRAQ. UNIVERSITAS EXIMIIS TANTI VIRI MERITIS / AC LABORIBUS IN PERPETUUM DEVINCTA / LICET LEVE PERENNE TAMEN / HOC GRATI IN EUM ANIMI MON. P. ANNO MDCI / CURANTE PERILL. 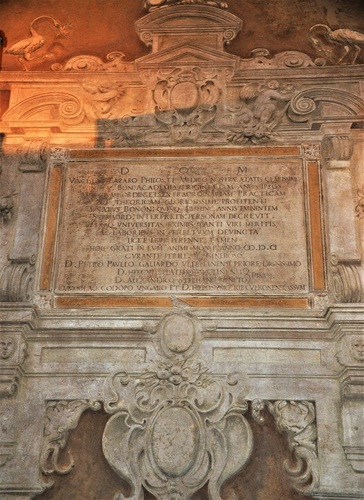 AC GENEROSO / D.PETRO PAULLO GALIARDO VITELIANENSI PRIORE DIGNISSIMO / D.HERCULE PLATESIO MUTINENSI / D.ALEXANDRO STEPHANO VENETO PRAS. 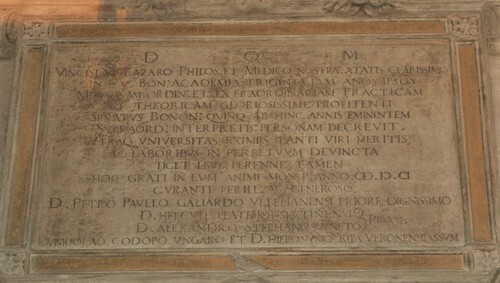 / D.NICOLAO CODOPO UNGARO ET D.HIERONYMO RIPA VERONENSI ASSUM.1". 1. Information taken from the descriptive label near the memorial (see last photo).